For the event we’re using the SMD Challenge board by MakersBox which utilizes a SOIC8 ATtiny85 to drive LED/resistor pairs in 1206, 0805, 0603, 0402, and 0201 packages. There will be a 5 minute inspection time at the start of the heat to open the kit, get familiar with the board, and confirm that you have all of the components and tools you need. We suggest not sneezing while placing that 0201 part down on the board — there is a spare set of 0201 parts only in the kit so you might get one extra chance with the smallest parts if you need it, but replacements will not be provided for parts lost during the heat. There will be eight heats of six people participating so make sure you get signed up as soon as you get to Supercon. You can only compete once and you must use our soldering iron and solder. We will also have magnifiers, tweezers, flux, and desoldering braid on hand. You can bring reasonable tools and other support materials; Supercon staff running the challenge are the arbiters of “reasonable” in this case. Scoring is based on time, completion, functionality (of the circuits you attempted to complete), neatness, and solder joint quality. If the top score is a tie, the fastest time across all the heats will be the winner. The official rules are on the event page so take a moment to look them over. The real prize is the bragging rights of being the Hackaday soldering virtuoso. Do you have what it takes? Someone reading this right now will be. But the first step is to show up at the Hackaday Superconference. See you there and good luck! Not that I go to CONs but this one seems like it would be THE one to go to. Would be cool to watch all the participants work live through each microscope on large displays/TVs or maybe live broadcast on youtube. That is, assuming they have the sort that will accept cameras. The only “difficulty” there is the 0201 but it’s doable. Make it more difficult by making an 0201 array spaced by 0.15mm on the sides. To make it really evil, add a big copper plane on one of the pads. That’s when you wish they use thermal relief in the layout. You haven’t seen the mandatory soldering iron, my friend. You’ll need it, if either end of the SMDs are to be connected to a ground plane! 2) The 0201 resistor was super easy, the 0201 LED not as easy. 3) Probably less stress and sleep deprivation here than at DEFCON. That, and being an event more oriented toward this sort of thing, should provide some nice times for me to compete against in the future. 4) The pads on this board are certainly NOT sided for hand soldering, and the soldering irons provided don’t make things any easier. 5) At DEFCON we had no choice in solder or iron – we had to use a specific no-clean with whatever iron we were lucky to be in front of. Could bring other things though, so I did (tweezers, loupe, brass tip cleaner, flush cutters, and borrowed some tape). We have 60-40 rosin core. We also have no-clean flux core which is ultra-thin and I think 37-63? Competitor’s choice on which to use. It should be mentioned that Hackaday’s own Jenny List brought up the idea of a soldering competition about a year ago. Her early excitement laid the idea that has developed into this. We just didn’t know at first how to standardize the challenge… until MakersBox came along with this simple little board. DEF CON 26 had the challenge going in the Hardware Hacking Village and we’ve seen challenge boards pop up all over the place, Toor Camp… at the bar at MFNY this year. This is going to be a ton of fun! I wounder though about using the time taken as a metric. Sure, limit the maximum available time but competitors should be encouraged to take their time. Soldering, though taken for granted by the experienced, really is an art form. 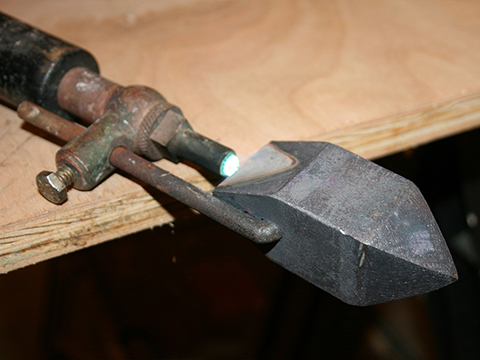 Trying to hurry soldering is what causes many cold joints further down the track because you haven’t waited for the solder to reach full flowing properties. +1 Soldering is art. I handle with SMD nearly at daily basis at work as repairman in local radio modems producing company. Any chance of a Hackaday Superconference in Chicago? No… No, it has not. Chickens have beaks. FYI: The old Commodore C= logo was called chicken lips. I’ll second this question, would love to have HaD show up here! I know they were in town for IMTS, no reason we couldn’t also fill the entirety of McCormick! Working on my own take on this and the LED deadbug ring from a few days ago. Hope to have it finalized for next year’s VCF shows. Under a microscope these are really not a big deal, but they are fun but I would not want to be in a rush. Funny how they indicate just how small the 0201 is without mentioning a 01005 on the Misery Edition though.